Power Squaring Shears (Inch) 1/8" ~ 1"
Are You Looking For A Good Used Metal Cutting Shear Machine? We have dozens of Drills for Shears & in stock. 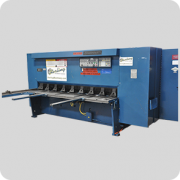 Buy, Sell, Trade NEW and USED Metal Hydraulic Shears for cutting 10 Gauge, 12 Gauge, 14 Gauge Thick Steel, Stainless or Titanium Metals. IN STOCK, UNDER POWER Brands Cincinnati, Niagara, National, Baileigh, US Industrial and more. 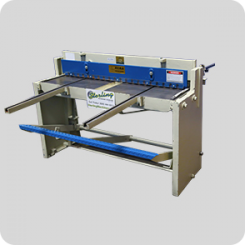 Used for straight shearing at 1/8 ~ 1 on sheet metal, coils, and plates (also known as squaring shear, power shear, or guillotine). May be foot powered (or less commonly hand powered), or mechanically powered. Works by first clamping the material with a ram. A moving blade then comes down across a fixed blade to shear the material. 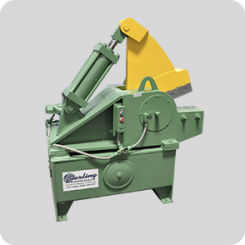 For larger shears the moving blade may be set on an angle or rocked in order to shear the material progressively from one side to the other; this angle is referred to as the shear angle. An alligator shear is a metal-cutting shear with a hinged jaw, powered by a flywheel or hydraulic cylinder. 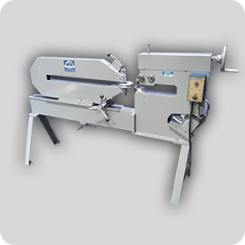 Alligator shears are generally set up as stand-alone shears, in which each stroke is actuated by the operator, often with a foot control. 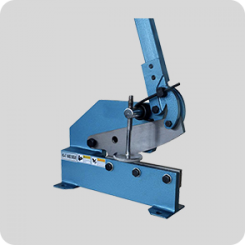 They are generally used to cut pipe or other long-length scrap metal material, like angle irons or I-beams. A rotary shear designed for cutting circles and rings where the edge of the metal sheet cannot be used as a start. A Shear is a machine that uses sharp blades to cut through sheet metal. Popular brands include Wysong, Amada, Niagara , Cincinnati , and Lodge & Shipley. 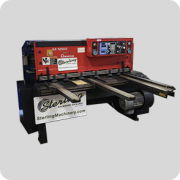 You can buy a shear that is hydraulic, mechanical, air clutch, air trip, and of course "CNC" or computer numerical controlled..